To know what you want to preserve in your community, you need to know what you have. 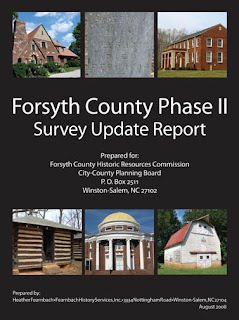 Forsyth County’s Architectural Survey Update was completed and a number of significant buildings and neighborhoods were recognized by the North Carolina State Historic Preservation office and placed on the State’s Study List for the National Register. As part of the project, a historical context was written about the development history of Winston-Salem from the 1920s to the 1960s. Additionally, research and documentation has begun for a countywide agricultural history. Since the adoption of the 2001 Legacy Plan, the Historic District and Historic Properties Commissions merged to more efficiently and comprehensively monitor and protect the historical and cultural resources of the county. The Commission produced a number of publications and studies to make information on preservation available to the public.